First of 249 pages of the diary. Elizabeth Webster was my 3x G Grandmother, born in 1798 in Wirksworth, Derbyshire. She was an ordinary working class mother and grandmother who kept a remarkable memoir of her life. This unique document gives an insight into living conditions and the influences on everyday life. Through the diary we are able to learn much about her family, the local community and the way of life for agricultural workers in the 19th century. Elizabeth was the oldest of eleven children born to James Webster and Sarah Adams. 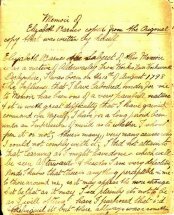 James was employed by squire Hurst at the Alderwasley Iron Works, and we learn from the diary that he was 'of weak constitution and of a consumptive family'. Her father had been an agricultural labourer until his marriage, and Elizabeth believed his move to the iron works had contributed to the deterioration in his health. She also considered that the men who worked at the iron works spent too much time in the 'Alehouse' and paid insufficient attention to their homes and families. Elizabeth was a devout christian and from a young age, distanced herself from such behaviour. As a young girl she was close to her uncle Samuel Adams. Samuel was only ten years older than Elizabeth and was a Calvonist, attending the old meeting house at Ridgeway, Heage. He introduced Elizabeth to the Sunday School at the meeting house, where she was taught by Mr Hutton, a teacher from Belper. recognised that it would have meaning to me even at such a young age. and I'm pleased to be able to offer something in return for a change. been by the work of Elizabeth. All this from a document maintained by my GGG Grandmother. I hope that you and your readers find the diary as inspiring as I have done, and look forward to the surprising contacts it may yet provide.